Last Wednesday (February 20), recently elected Brazilian President Jair Bolsonaro presented Congress with his draft of a new constitutional amendment aimed at controlling pension spending by setting minimum retirement ages to 65 for employed men and 62 for women, implemented over a 12-year transition period. The package “seems to go in the direction of reducing imbalances significantly,” says Mario Mesquita, an economist at Brazilian bank Itaú (The Economist). Mexico’s recently elected Lopez Obrador administration has announced plans of a new mobile payments system run by the central bank that will allow Mexicans to make and receive payments via smartphone without charge. A pilot for the platform, CoDi, is expected to launch by March. According to Reuters, an estimated 42 million Mexicans lack bank accounts, inhibiting growth potential for Mexican business. “Jaime Cortina, director of operations and payments at the central bank, said the goal was to develop a payment method that Mexicans could use to make payments between each other, in shops and online". The payments platform will be powered by Mexico’s existing interbank payments system which includes established institutions like BBVA’s Bancomer, Banco Santander and Citigroup Inc’s Citibanamex. The unbanked Mexican population is faced with a Catch-22. 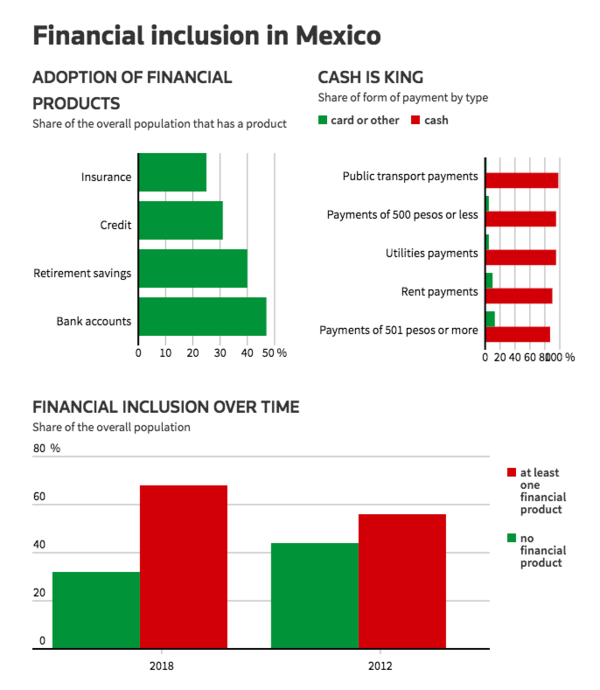 Most Mexicans still prefer to pay with cash over card, a trend that the government’s new payments platform is working to transform. However, CoDi requires users to have a bank account with one of these existing banking institutions, therefore defeating the purpose of providing financial services for the unbanked population. This Monday (February 25), Spanish telecommunications group Telefonica announced it will be launching Internet para Todos Peru (IpT): open access, wholesale rural mobile infrastructure operator which aims to help bridge the digital divide in Latin America. IpT, backed by Facebook, Inter-American Development Bank (IDB), and Development Bank of Latin America (CAF), will offer open-access technology and revenue-sharing models to keep costs low. “Telefonica, the largest internet provider in Peru, said that if successful, the project’s business model can be replicated across Latin America to deliver mobile broadband to millions of people who live in remote areas” (Reuters). The company’s goal is to bring mobile broadband service to remote communities where traditional telecommunications infrastructure has not yet been economically feasible. According to Telefonica, about 100 million people, 20 percent of the Latin American population, do not yet have widespread access to mobile broadband. Mexican banks are bracing for AMLO reaction, in response to high banking fees creating problems for the Mexican economy and individual customers. 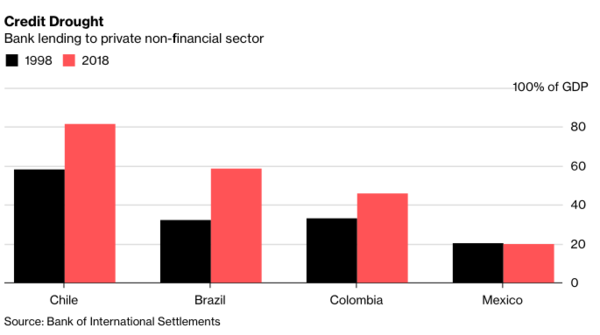 According to financial consumer-protection agency Condusef, international banks operating in Mexico earn roughly one-third of local revenue from fees and commissions, versus one-fifth in home markets where there is more interest income from loans (Bloomberg). The question facing the Mexican government is finding a solution to bring charges down and increase credit flow, whether it be via law, regulation, or political pressure. According to Americas Market Intelligence report “LATAM Resources and Infrastructure: The Good, Bad and Ugly for 2019”, the election of business-friendly administrations should boost investor confidence in infrastructure and natural resources sectors this year. In terms of “the bad”, 2019 can expect economic and political volatility in LATAM. Brazil’s Bolsonaro administration will likely confront tension with Congress, as the party lacks a stable legislative majority. Opposition from local communities and security concerns will be a rising challenge for LATAM infrastructure in 2019. In the case of Mexico, the Morena party, holding a majority in Mexican legislature, “has proposed to amend the country’s mining law, calling for increased social impact studies and giving the Ministry of Economy the power to cancel mining concessions in case of ongoing conflicts” (Reuters). Moving forward, security risks must be confronted in Colombia, Brazil, and Central America to ensure sustainable development on investment and increase profitability for infrastructure and natural resources companies in both the short and long term. As changing public and political attitudes about the legalization of cannabis fuels global growth and demand, Latin America’s cheap labor and agricultural experience could make the region a key player in the legal cannabis market. According to the LATAM Cannabis Report, the market hit $125 million USD in 2018, with forecasts predicting growth up to $12.7 billion by the year 2028. With the legalization of cannabis in Canada and important discusses taking place throughout Europe, some companies have taken an early interest in the LATAM cannabis market. The deal, worth roughly $300 million USD, allowed Aphria to buy into the entire supply chain- giving them access to cultivation, manufacturing, and extraction- therefore allowing them to produce and export cannabis back to Canada while maintaining low costs by capitalizing on free trade agreements between Canada and LATAM.